Arrival at Inhambane Airport, meet&greet and transfer to Zavora. Guests will be accommodated at Doxa Beach Hotel *** – The hotel can easily sleep 28 people in 14 comfortable and spacious rooms – with the option of having a twin or double bed or even fitting a third bed in for a child. All rooms have en-suite bathrooms including a separate toilet, washbasin and shower (and/or bath depending on the booking). The beds, mattresses as well as mosquito nets have been chosen for maximum comfort and the majority of the rooms (and beds!) are facing the ocean offering stunning views (sunrise and even whale watching opportunities). Dinner, bed & breakfast at Doxa Beach Hotel – two boat dives. Zavora is an undeveloped area with great diving and kilometres of absolutely gorgeous unspoilt beach stretching as far as the eye can see! In addition to fantastic shallow and deep reefs, Zavora has two wrecks – a 10500 ton liner lying in 53m (the Klipfontein) and a 300 ton fishing vessel, (Rio Sainas) in 32m. Dinner, bed & breakfast at Doxa Beach Hotel *** – two boat dives. With a wide variety of dive sites, Zavora can accommodate divers of any level – and we constantly explore in order to add new sites every year. Zavora is the hidden manta ray hotspot of Mozambique – the Southern Gate of the Megafauna zone. In Zavora, the manta ray cleaning stations are in shallow waters allowing us a good hour of interaction! Zavora is also the home of the A.C.C.M. – Zavora Marine Lab. an interesting laboratory built out of compressed sand and glass bottle walls. Zavora Marine Lab. has, since 2009, developed research and environmental education in the region. Divers are welcome to visit the lab and participate in activities. Here over 300 individual manta rays have been identified, 250 species of nudibranch and sea slugs catalogued and more than 100 groups of humpback whales counted daily during winter- a stunning place! Breakfast , time at leisure and transfer to Inhambane airport. End of services. Mozambique beckons with its coastline and swaying palms, its traditions, its cultures, its vibe and –most of all – its opportunities for adventure. This enigmatic southeast African country is well off most travelers’ maps, but it has much to offer those who venture here: long, dune-fringed beaches, turquoise waters abounding in shoals of colourful fish, well-preserved corals, remote archipelagos in the north, pounding surf in the south and graceful dhows with billowing sails. 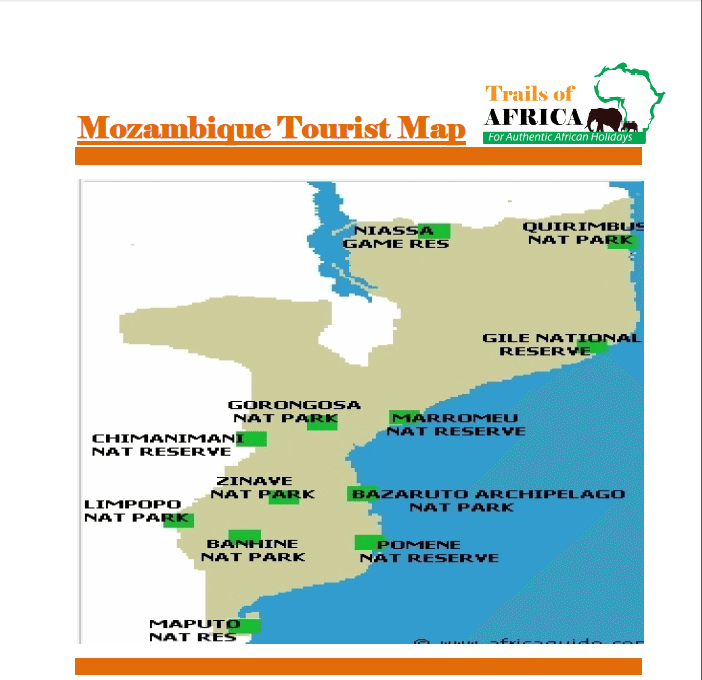 Most safaris to Mozambique incorporate a bush experience, visiting the untamed Transfrontier Peace Park and/or the Maputo Elephant Reserve. You also get to experience Mozambique’s rich culture and colonial past in the towns and cities visited during safaris, as well as the exotic cuisine and abundant fresh seafood of this beautiful country. Add to this colonial-style architecture, pulsating nightlife, an endlessly fascinating cultural mix and vast tracks of bush populated with elephants, lions and birds galore. Discovering these attractions is not always easy, but it is unfailingly rewarding. Bring along some patience, a tolerance for long bus rides and a sense of adventure, and jump in for the journey of a lifetime.